So, it looks as though the only chips destined for your wheelie bin will come from a deep fat fryer, not Silicon Valley. The coalition has dumped Labour’s proposed ‘Bin Tax’ on history’s rubbish tip, instead dangling the carrot of a recycling incentive scheme. 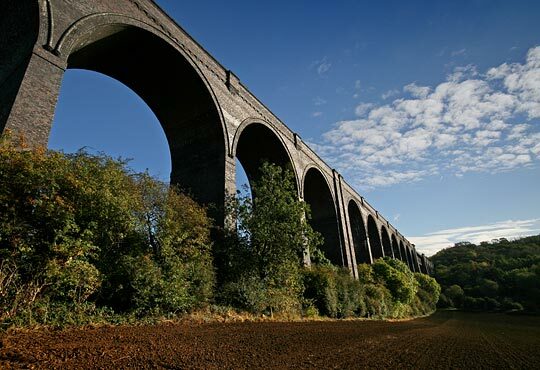 This is timely news for two imposing disused railway viaducts which, thanks to their combined makeup of 24 million bricks, would surely have bankrupted any company charged with disposing of them. Despite neither being listed, they have survived several decades of redundancy to reprise their role as functional parts of our transport infrastructure. 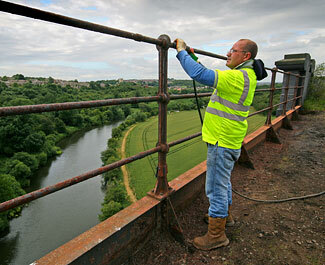 Walkers and cyclists fly high over the River Don on Conisbrough Viaduct's lattice girder span. Supported largely by a group of mine owners, the Lancashire, Derbyshire and East Coast Railway (LD&ECR) arose from a desire to drive a rail connection from the Manchester Ship Canal at Warrington to the Lincolnshire port of Sutton-on-Sea. Hugely ambitious, the plans encompassed a skyscraping viaduct of almost 300 feet across Monsal Dale in the Peak District. But the finance needed to realise the scheme was not forthcoming, leaving the Chesterfield-Lincoln section as the only one to enjoy fruition, engineered by Robert Elliott-Cooper. This though was not lacking in serious feats, with two tunnels extending for more than 3,100 yards. Between Fledborough and North Clifton, towards its eastern end, the line crossed the flood plain of the River Trent on a sweeping viaduct. Costing £65,000 and a little over half-a-mile in length, it comprised 39 brick arches on the west bank, with a further 20 on the east. Over the channel were four 110-foot bowstring girder spans - replaced by a more austere single-track structure in 1964 - supported on pairs of braced cast iron columns. The first passenger train broke the skyline on 15th December 1896. Looking west along the length of Fledborough Viaduct. The Great Central Railway took the route over on New Year’s Day 1907. As its staff got to grips with management upheaval, another great edifice was taking shape 25 miles to the north-west. Fastened between two 80-foot steel masts was a Blondin - an aerial ropeway named after the celebrated tightrope walker - employed to carry men and materials 625 yards across the Don Valley. 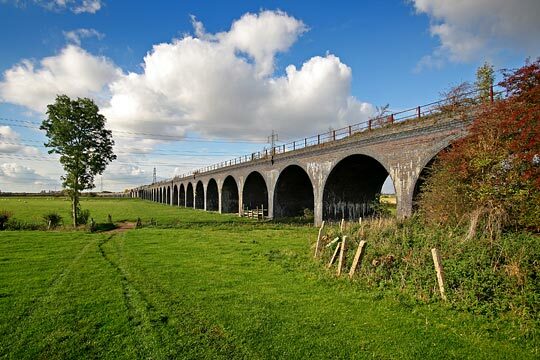 Alongside it Conisbrough Viaduct was rising, helping the new Dearne Valley Railway to connect the Hull & Barnsley’s line at Brierley Junction with the Great Northern and Great Eastern network near Doncaster. Red brick arches faced with two courses of blue engineering brick - 14 on the north side and seven to the south - were united by a 160-foot lattice girder span, 116 feet above the water. Messrs Henry Lovat Ltd had fashioned a colossus which dominated its valley. Trains started to tame it on 17th March 1909. In an imperfect world, sentiment is always trumped by economics - a reality to which nothing is seemingly immune. After just 57 years of service, retirement day came for Conisbrough Viaduct on 11th July 1966. It remained in the hands of British Rail and then BRB (Residuary) until 2001 when agreement was reached for its transfer to Railway Paths Ltd - a body set up to acquire and look after potentially useful railway land and structures on behalf of sustainable transport charity Sustrans, until such time as the latter was able to incorporate them into its National Cycle Network. Conisbrough is a truly Goliath structure, dominating its valley. Despite being a liability of very significant proportions, Conisbrough was recognised as forming a valuable link across the Don Valley from the hugely successful Trans Pennine Trail - which also occupies sections of former trackbed - to the villages of Warmsworth and New Edlington, then onwards into Doncaster. This reality was not lost on locals who, for many years, had unofficially adopted it as a footpath, fighting off the efforts of duty holders to secure the viaduct out of use. Formally restoring it as a right of way would involve work and, therefore, money. 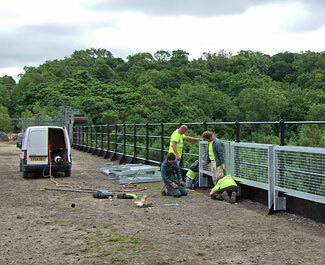 In early 2008, the Railway Heritage Trust provided a grant for the installation of panels alongside the girder span’s existing cast iron handrails, making it safer for the public. Grafting hard on that occasion was Sustrans’ own construction team. Later in the year, Doncaster Council opened a path from the southern end of the viaduct, through a deep cutting, into the aforementioned villages. Then both the Council and the Trust put their hands in their pockets again, contributing to a funding package which enabled the charity to move forward with the remaining works. ...(right) new panels were installed in front of them to improve public safety. 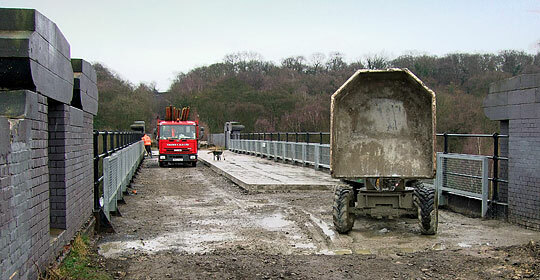 Needed were a 2.5-metre bitmac path as well as waterproofing and reinforcement for the river span. In February, Sustrans’ regular subcontractor Calder CAD - called-in because of tight timescales - began the construction of a reinforced concrete slab, laid to fall to six core-drilled pipes through the deck. Gullies along the edge would then drain water into the river below. Elsewhere, the extant ballast was levelled before planings were laid and the tarmac put down on top. The structure’s weight restriction determined the use of lightweight plant and machinery, all of which had to be removed at the end of each shift thanks to the anti-social tendencies of some neighbourhood outlaws. 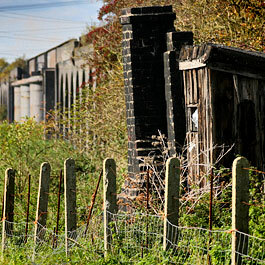 Although waterproofing generally forms part of these schemes, such is the extent of Conisbrough Viaduct that it was deemed not to be financially viable on this occasion. It was though agreed that the approach taken was perfectly adequate - the structure’s condition was not being adversely affected by drainage issues and the pathway was unlikely to cause any. By early April, it was done and dusted. With little fuss, a Goliath had been resuscitated, legitimising the community’s exploitation of their local landmark. Subcontractor Calder CAD lays a concrete slab on the river span. And after its operational life was prematurely cut short by a derailment at nearby Clifton in February 1980, Fledborough Viaduct is also serving a transport purpose again. At its western end, Network Rail’s High Marnham test track has brought trains back to the former LD&ECR alignment but the structure itself spent 30 years in the wilderness before turning the heads of those trying to establish a traffic-free route for pedestrians and cyclists between Sheffield and Lincoln. Until recently, they were forced two miles further north to Dunham-on-Trent - the nearest crossing point of the river where the busy A57 spans it via a toll bridge. This was an uncomfortable option for all those on the road. 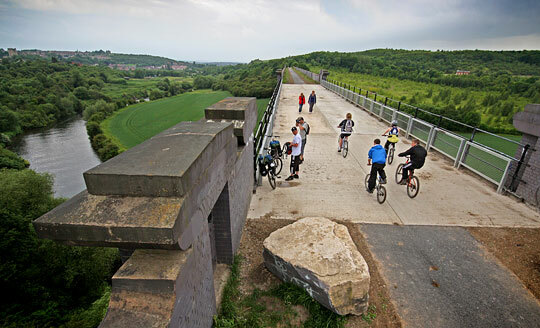 But now, after Nottinghamshire County Council secured its parapets and laid down a surface, the former railway structure has helped to safely bridge a gap in the National Cycle Network. On 5th June, dozens gathered on it for a picnic to celebrate its return to functionality. To the west side of the river, 39 of Fledborough's brick arches curve south. 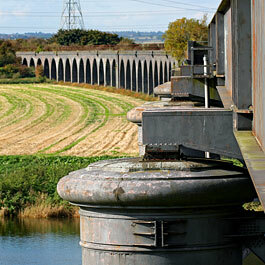 Fledborough and Conisbrough viaducts faced a future of uncertainty until recycling rode to their salvation. At a time when the country is staring into a financial abyss - not to mention paying the price for obesity’s scourge - it would have been a scandal to allow their potential to be wasted. Foresight, toil and a few coppers from down the back of the settee have saved two hulking great lumps of industrial heritage, allowing leisure and tourism to colonise them. Pedal power is clearly a force to be reckoned with. 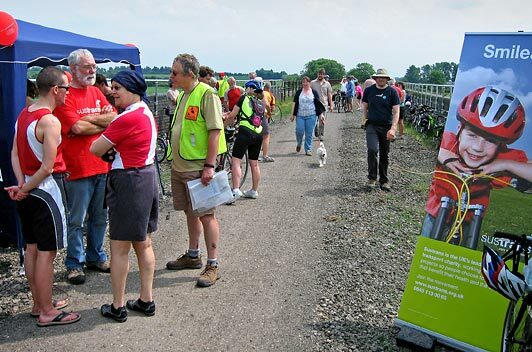 On 5th June 2010, walkers and cyclists gathered for a celebratory picnic to mark the opening of Fledborough Viaduct. Historical overview of Fledborough Viaduct.